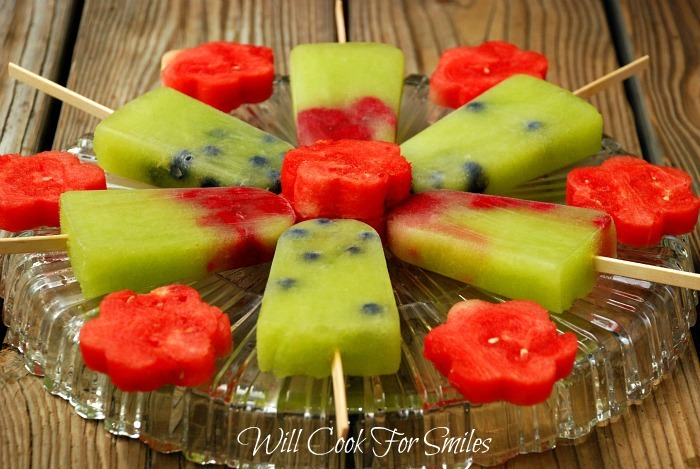 Weather is getting hotter and hotter, we definitely need some refreshing snacks to keep cool. 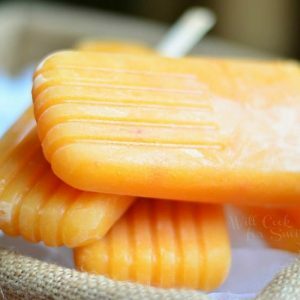 These Ginger Peach Green Tea Popsicles are a tasty way to cool down on hot summer days. They are made with fresh ginger, succulent peaches and smooth green tea. …so grab some popsicles and cool down! I can’t believe it’s the end of May already, it’s feeling more and more like summer. Not my favorite time of the year since I live in FL. Heat coupled with humidity makes for some miserable time outdoors. So it’s important to be able to refresh and cool down after playing outside and fruit pops is a great way to do that. These popsicles were actually inspired by my favorite tea. I love Peach Ginger green tea and I wanted to bring this flavor combination into this frozen treat. 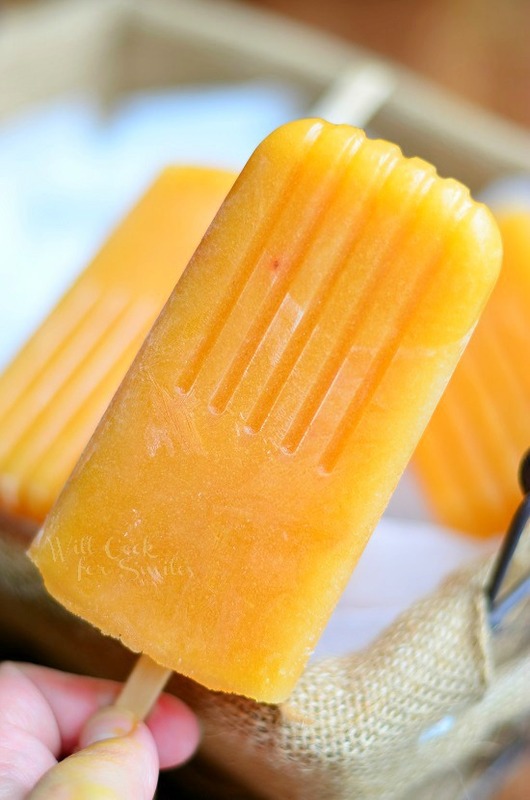 These pops are very light and hold all the benefits from fresh ginger and ripe peaches. 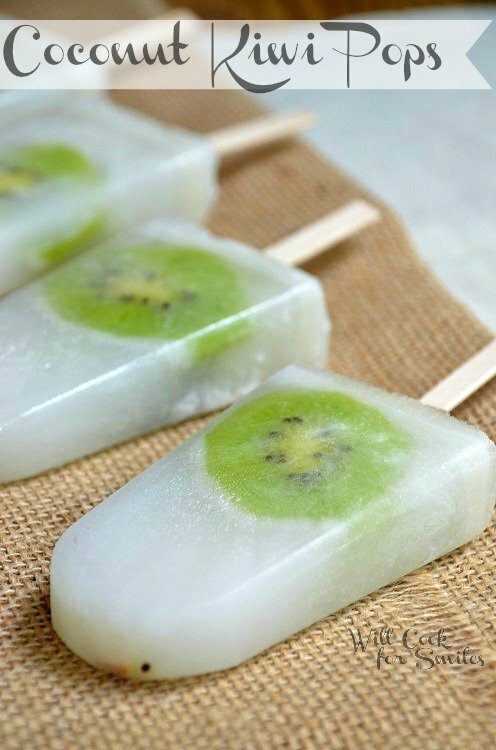 You can also choose to sweeten these pops with honey instead of sugar for added benefits. 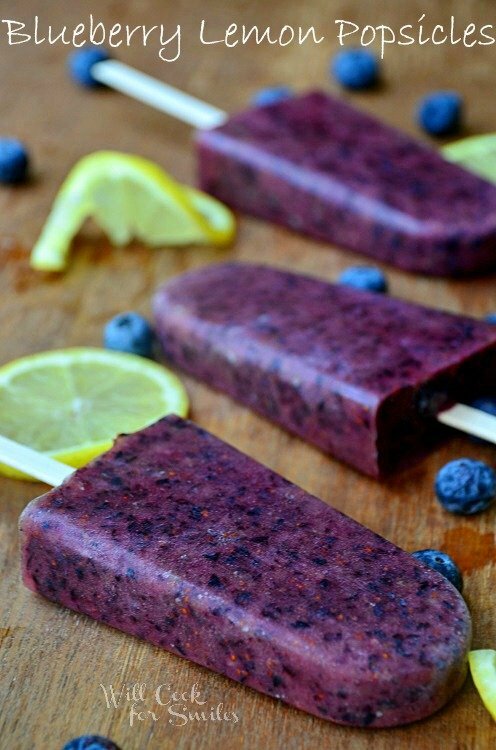 Either way you go, these popsicles are still very lite and jam packed with vitamins and nutrients! 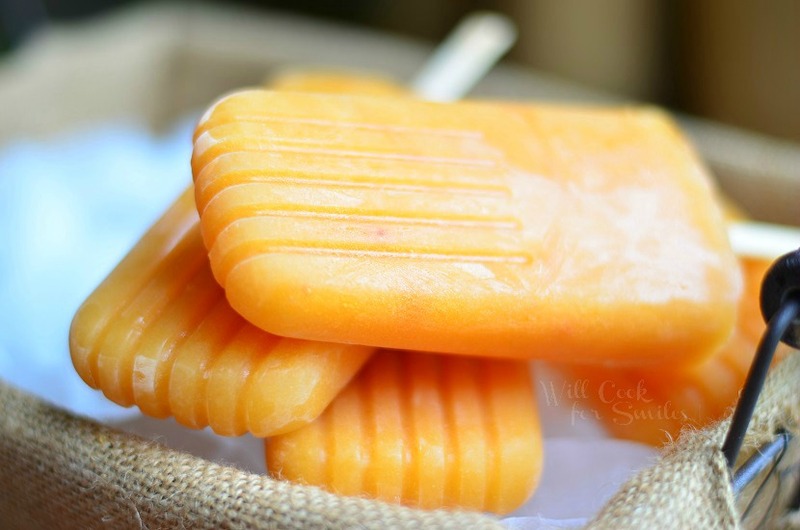 These Ginger Peach Green Tea Popsicles are a tasty way to cool down on hot summer days. They are made with fresh ginger, succulent peaches and smooth green tea. 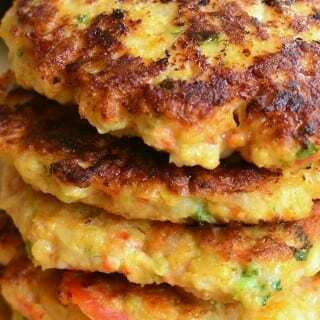 Combine skinned and pitted peaches and fresh grated ginger in a blender and pulse until all smooth. Combine hot green tea with sugar and stir until sugar is dissolved. Add sweetened green tea to the blender and pulse a few more times to make sure all is well combined. 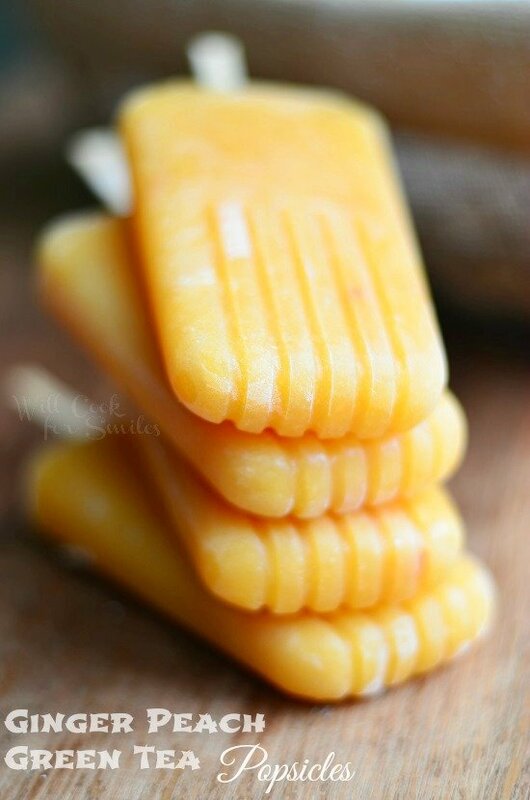 *If your mold doesn't have tops, use wooden popsicle sticks: cover the mold tightly with saran wrap and quickly poke wooden sticks through the center of each mold. Saran wrap will keep the sticks standing up while the popsicles freeze. A great combination of some of my favorite flavors! I just finished a run and this would be a refreshing way to cool off. Thanks for including a link to my popsicles! 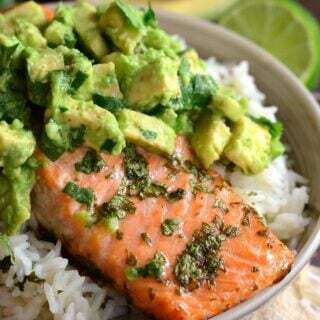 They would be perfect after a run! Thank you, Ashley! Those sound delish! Love the peach + green tea combination, it sounds so refreshing and light especially in the warm weather. Thank you, Rachel! So sweet of you! 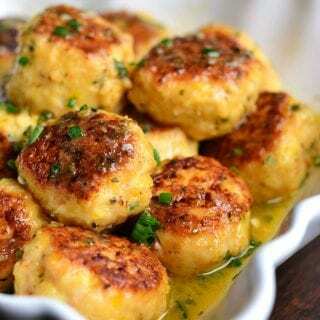 Lyuba, these are AMAZING!!! 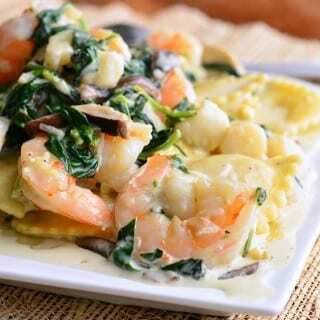 Love the flavors and your pictures are really great. Thanks! What a lovely combination of flavors. Very summery. 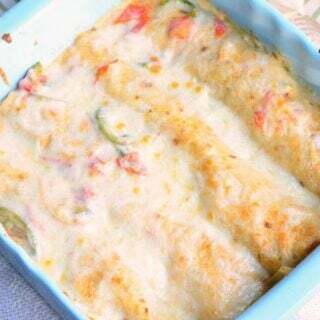 I will definitely be trying these. Yum! Fanno venire la voglia di sole, mare e di estate. Yes! It’s very sunny and summer inspired! Thank you, Daniela! Thank you so much, Sherru! 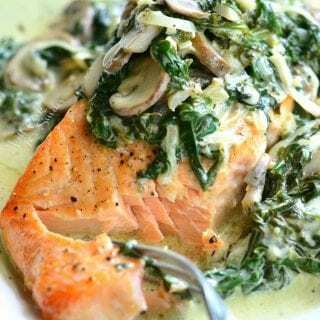 I love this idea and especially with ginger and green tea. What a delicious summer treat! Thanks for sharing!